Hennessey Funeral Home and Crematory and the Hispanic Business Professionals Association present their 1st Annual Dia de los Muertos party. The Day of the Dead is a celebration of life when we remember and revere our departed loved ones. On Friday, October 30 from 5pm until 8pm, Hennessey Funeral Home and Crematory will be holding a family party with free activities like pinatas, face painting, photo booth, games, crafts, door prizes and much more. Taqueria Fiesta Brava will be serving 2 street tacos and a beverage for $5. The party will be held at Hennessey Funeral Home at 1315 N Pines in the Spokane Valley. Seating is limited so reserve your family fun on the HPBA Spokane Facebook or email hbpaspokane@gmail.com. Visit Spokane's Annual Meeting is Wednesday, October 28 at the Spokane Convention Center Centennial Ballroom. The meeting will include Visit Spokane's annual report, a look ahead, presentation of tourism awards and a keynote presentation by Gilad Berenstein, CEO and founder of Utrip. Doors open: 2:30pm, Program: 3-4:30pm, Networking runs from 4:30-5:30pm. Pink is beautiful, especially pink ones! Mayor Condon helped The Susan G Komen, Eastern Washington Affiliate, light up the Steam Plant smokestacks in bright pink last Friday evening at 6pm in honor of Breast Cancer Awareness. The will remain pink until the end of the month. Breast cancer awareness month is a time to raise awareness of the importance of early screening and detection for Breast Cancer. The Susan G Komen Eastern Washington Affiliate funds 15 programs locally that help breast cancer patients, survivors, and their families. Over the last ten years the Affiliate has awarded over three million dollars to help our community. 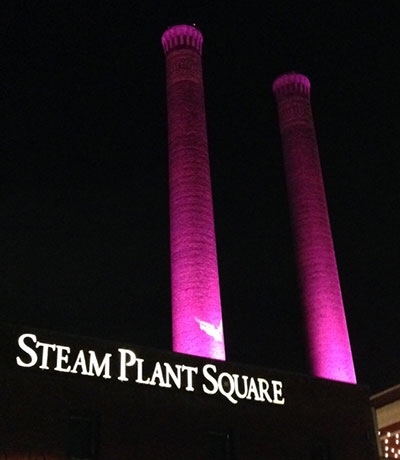 Take a look at those beautiful pink smokestacks this week and think about a CURE! Keith Georgeson, M.D. has been named chief executive of Sacred Heart Children's Hospital. Dr. Georgeson will assume his new responsibility in January 2016. Sacred Heart Children's Hospital is the largest children's hospital in the Providence Health & Services five-state system (Washington, Montana, Oregon, California and Alaska), serving patients and their families from Canada to Oregon, and throughout eastern Washington, north Idaho and Montana. Its service area extends to about 1.5 million people. It is the only facility in the region prepared to serve the most critically ill and injured children who require complex care and extended hospital stays. It has 177 beds and a full range of specialties representing all major pediatric subspecialties. The hospital provides the region's only Level IV neonatal intensive care, pediatric intensive care and a dedicated children's emergency center with Level II trauma care, among other specialty services. Dr. Georgeson is nationally recognized as a leader in children's health care. He served as director of the American Board of Surgery from 2000-2006 and chairman of the Pediatric Surgery Board of the American Board of Surgery from 2003-2006. He is past president of the American Pediatric Surgical Association, and a founding member and past president of the international Pediatric Endosurgery Group. In 2011 he was awarded the William E. Ladd Medal from the American Academy of Pediatrics for his contributions to the field of pediatric surgery. He received his medical degree from Loma Linda University; and completed a fellowship in pediatric surgery at Children's Hospital of Michigan. He spent most of his academic career at the University of Alabama School of Medicine and was chief of surgery at Children's Hospital of Alabama for more than 20 years. Dr. Georgeson has served as chief of children's services at Sacred Heart Children's Hospital for the past three years. Meridian Construction, Inc. of Spokane was just awarded the $3,200,000, 12,500 square-foot Fire Station for the City of Kennewick. This new facility will have 4 apparatus bays, offices, crew living spaces and support areas. A ground-breaking ceremony was just held on October 13, and this is the first fire station built in the last 20 years in the City of Kennewick. Meridian has constructed several fire stations for the Spokane Valley Fire Department including a training center over the last several years as well as a $3,500,000 Spokane Valley Fire Department Administration Building. Meridian Construction, Inc. is a locally-owned, general contractor, specializing in healthcare, office, retail, industrial, and casino projects across the country. Mark D'Agostino, owner and president, has been in business for over 15 years and currently employs 20 field and office staff. More information can be found on their website, www.meridianco.com. St. Luke's Rehabilitation Institute's research department is looking for qualified participants to take part in a stroke-related clinical trial. The Milestone Study, occurring at approximately 80 sites in the US and Canada, examines the effect of a study drug on participants who have difficulty walking after suffering an ischemic stroke, where there is a clot in a blood vessel supplying blood to the brain. "Researching trial drugs, like the dalfampridine extended release tablets used in the Milestone Study, may allow us to find treatments that can potentially benefit those living with the long-term effects of stroke," said Doug Weeks, Ph.D., St. Luke's research director. "In addition to physical therapy and rehabilitation, we hope to offer patients potential medication to assist with their stroke." St. Luke's researchers are looking for participants who had a stroke six or more months ago and have difficulty walking, including those who are walking slowly or use a cane or walker, due to the stroke. The study lasts about five months and includes timed walking and balance tests as well as questionnaires on how the stroke has affected the participant's life and the ability to get around. To find out about participant eligibility, contact Ann Cooper at 509-939-8079 or Doug Weeks at 509-939-1316. 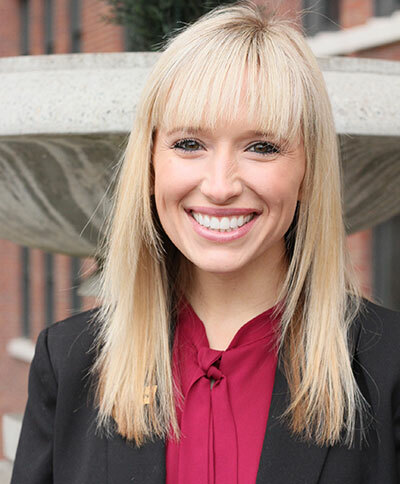 Davenport Hotels has promoted Briana Anderson to National Sales Manager handling all groups of 25 rooms peak or higher in the association, Sporting Events and corporate group markets that are based in the West, Mid-West and North East region of the US. Prior to this, Briana was a Sales Manager and Wedding Services Manager for Davenport Hotels. Briana will be selling all four hotels in downtown Spokane, which include The Historic Davenport Hotel (284 guest rooms), The Davenport Tower (328 guest rooms), The Davenport Lusso (48 guest rooms) and the new 716-room Davenport Grand Hotel (opened June 17, 2015). Davenport Hotels is aligned with Marriott's Autograph Collection, a portfolio of world-class, independent boutique and luxury hotels. The Southside Senior & Community Center honors Veterans at this time each year with a festive and thoughtful dinner tribute. A full military color guard will present the colors, recognizing each branch of the Armed Forces. Col. Brian Newberry, Former Commander of Fairchild Air Force Base, is the keynote speaker. The Emcee is Col. Chuck Lehman, Air Force retired, and entertainment will be provided by Pages of Harmony. All Veterans receive free dinners. To be held Thursday, November 5, 5:30pm. Tickets are $15 for non-vets; Veterans eat free. Call 509-535-0803 to reserve. David Peterson, Executive Vice President and Chief Operating Officer of Goodale & Barbieri and Tom Barbieri, President of Goodale & Barbieri, together with Dakota Pacific, a John R. Miller Company, recently announced they have completed the acquisition of the RLH Building, located on the north bank of the Spokane River in downtown Spokane. The six-story RLH office building includes 100,000 square-feet of office space and a 252 car parking garage. Major tenants include Red Lion Hotels Corporation, HomeStreet Bank, TransCanada Corporation, Mutual of Enumclaw Insurance, Wipfli LLP and Farmers Insurance. The Southside Senior and Community Center, at 3151 East 27th Avenue, will present Washington State University Chancellor Lisa J. Brown and Dr. Deb Harper as featured speakers at the second Community Leadership Breakfast Wednesday, November 4. The topic 'Health Care in Our Community'. Bringing their expertise and knowledge of health care, Chancellor Brown and Dr. Harper will discuss a broad range of issues. Topics include the history and status of the WSU medical school, health coverage issues, the future of health care in the region, and more. Their presentation will conclude with a question and answer session. Breakfast begins at 8am. The cost of $25 includes breakfast. For tickets, call 509-535-0803, and ask for Community Breakfast tickets. Great news - the Washington State Chinese Lantern Festival has been extended through November 15. The festival was originally scheduled to conclude on November 1, but due to the immense success the festival has had so far, it was decided to continue the event for two more weeks. For more information about the festival, visit spokanelanternfestival.com. Spokane Real Estate Agent Gayle Terry announces her new brand, Gayle Terry Real Estate. Her company has a new logo and a new website, gayleterry.com. Terry is a Realtor with Windermere Real Estate, with an office located at 2829 South Grand Boulevard. Mountain Gear presents the Banff Mountain Film Festival World Tour Friday through Sunday, November 20-22 at the Bing Crosby Theater. Enjoy a weekend of adventure with award-winning, exhilarating and inspiring films that highlight the best of mountain culture, adventure, climbing, travel and nature. Get tickets at Mountain Gear, 2002 N. Division or Ticketswest.com. For more information, call 509-325-9000.